A narrow dirt road starts where the paved roads of Bangladesh’s Habiganj district end, leading to a land of dusty red silt that often completely blankets the sub-district of Baniachang, blocking outsiders from seeing in. Even a small amount of rain can restrict outside access. As the roads become dirt tracts, no boat or vehicle can get in or out, leaving the small sub-district disconnected from the world. A team from the water, sanitation and hygiene (WASH) program at BRAC (formerly the Bangladesh Rural Advancement Committee) went to explore this wetland area, known as a haor, to select a location to pilot an expansion of its work. The situation was worse than they had expected. The people of this community live in deplorable conditions, with sporadic access to basic necessities such as safe water and hygienic sanitation. A few one-room houses shared by three to four families are built on top of hillocks, which barely have extra space to lie down. They make partitions with rag curtains to create their own space. Each hillock is 20 to 30 feet high. The area is frequently hit by flash floods, and these change the landscape drastically. 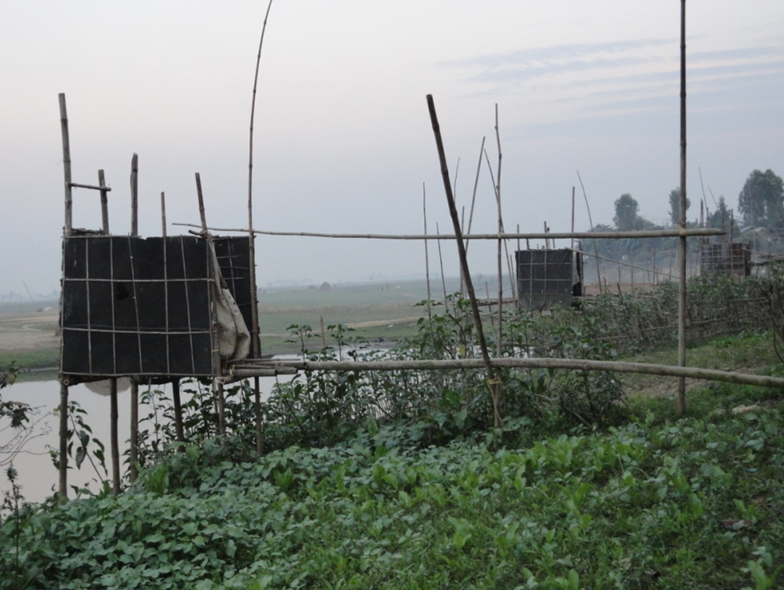 “The hillocks seem to turn into small islands in an ocean, the only difference being the depth of the water,” says Mohammad Abdus Salam, senior sector specialist in BRAC’s WASH program. 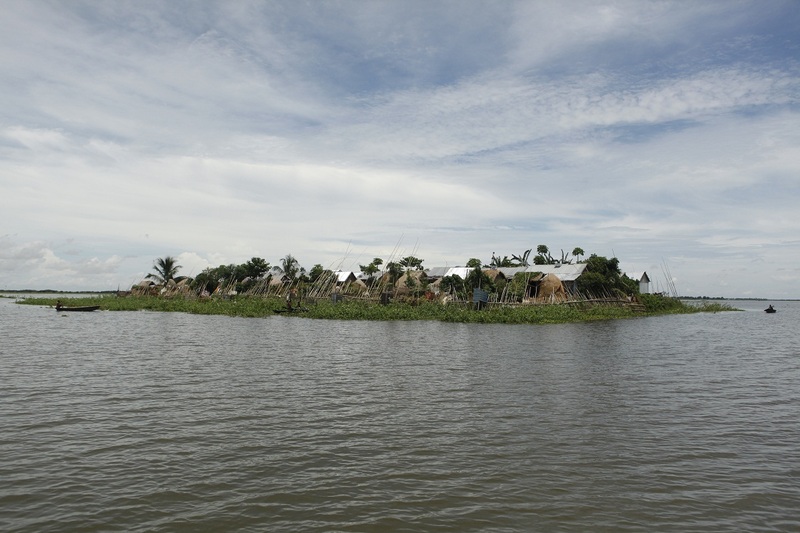 As the water rises, the huddled communities become uninhabitable until they reach the point where families have to share the one building that stays above water. The wooden posts prevent soil being washed away and are some protection against the water but families share this space with animals. During the rainy season inhabitants share the same rooms and sometimes even the same beds with domestic animals. The small makeshift hanging latrines built by the community during the dry season discharge their effluent directly into the waters below, polluting the environment in which people live and work. They are often hit by the flash floods, washing away the latrines and making life even worse. The women and children suffer the most. 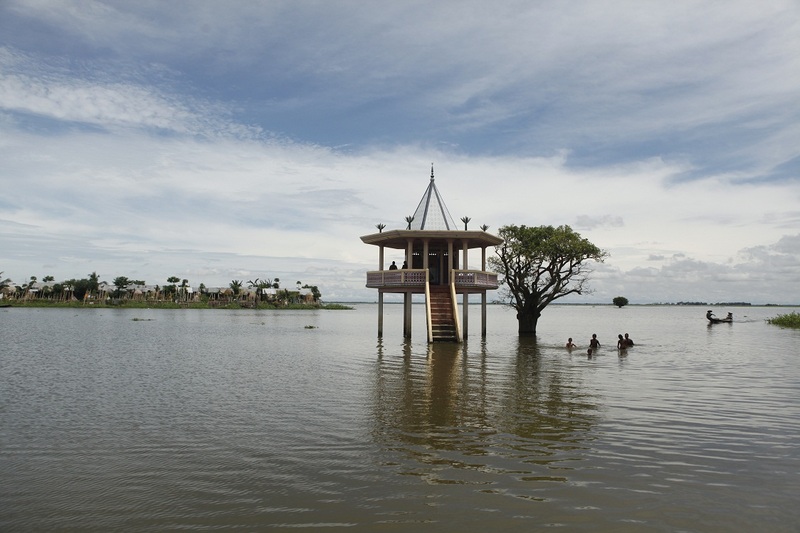 It is possible to build secure buildings that can stand above the water, but these are usually only buildings that are highly valued by the community, such as the mandir (temple), pictured below. BRAC’s WASH program is working with the communities to find a solution that will help improve sanitation, since the existing latrine facilities become dysfunctional with the flash floods so easily. Some ideas tested so far include floating latrines, where the superstructure rises up when the floods come and returns to the pit level when the waters fall again. 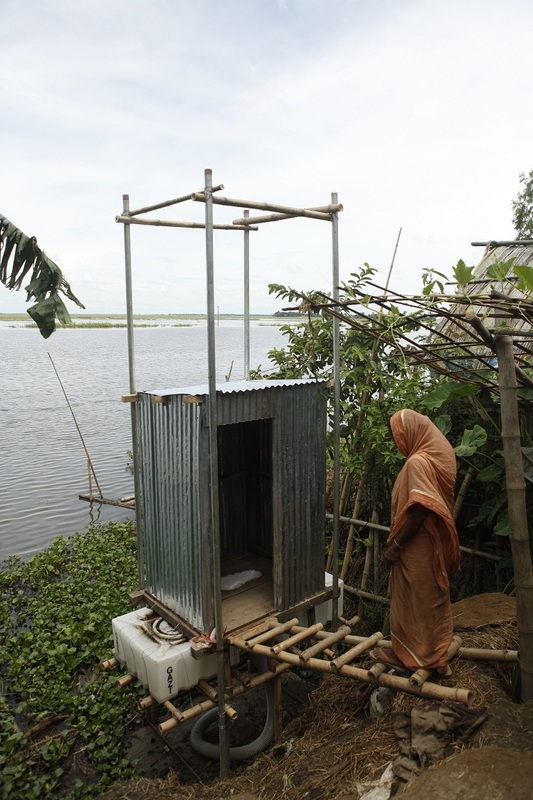 These latrines are designed to survive floods and can be used even when the waters rise. 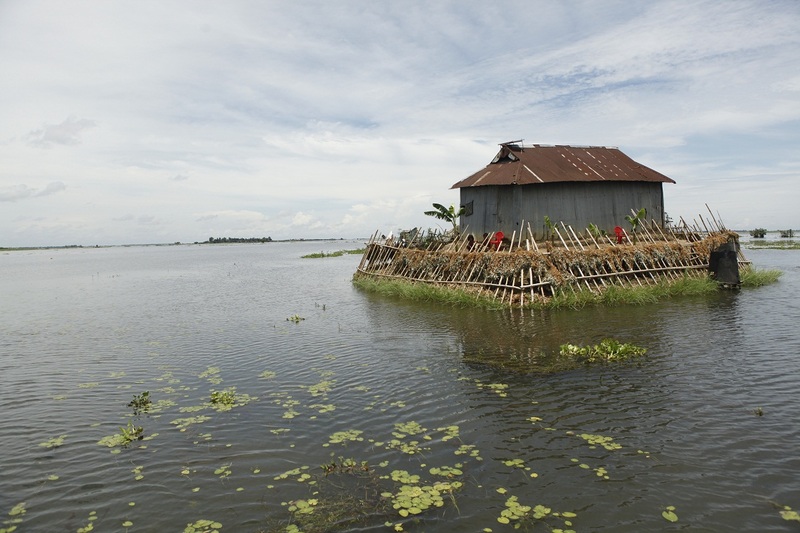 The floating latrine can be installed close to the water’s edge. The hole below the latrine has a sealed pit below reached by a flexible pipe that can expand as the waters rise, keeping faecal material enclosed. The white material is a polystyrene float and the whole superstructure and ladder rises as the waters rise. It is kept in place by scaffolding supports that are driven deep into the ground. 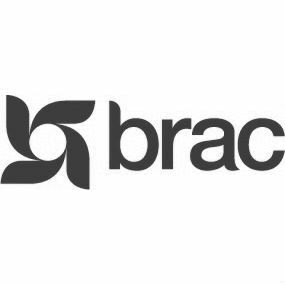 BRAC is currently testing this innovative design. As of last year, BRAC also began to pilot its integrated development program (IDP) in Baniyachang with 10 areas where BRAC WASH is supporting its effort. IDP is a holistic package of services -- health, education, microfinance, livelihoods training and more. A total of 11 components -- delivered simultaneously to areas identified through other BRAC programs and research as the most marginalized, deprived and excluded from mainstream development. BRAC is constantly discovering new frontiers for progress -- communities and households even more marginalized than anyone had ever imagined. IDP is an idea that came as a response to discovering these new frontiers, and the unique conditions that may -- or may not -- require such an approach. 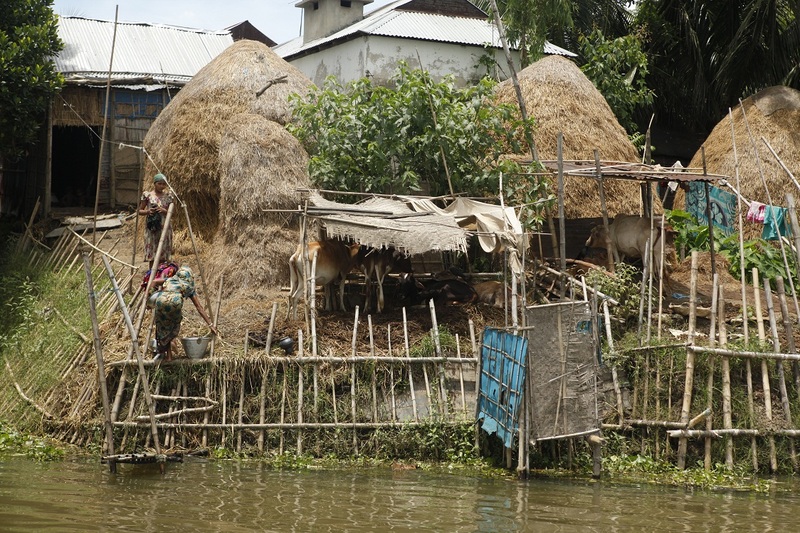 Floating latrines or IDP may sound innovative. The reality is we don’t know the results just yet, but BRAC’s commitment to the poor and marginalized means finding a way even when the road ahead is often clouded with dust. Sabrina Shahidullah is a senior communications specialist for the BRAC WASH program in Dhaka, Bangladesh. All photographs: Sumon Yusuf/BRAC. Sign up to learn more about how BRAC is organizing the poor to create change on a massive scale. Like us on Facebook.